The Chesapeake Bay is the largest shallow-water estuary in the Americas, where salty water from the Atlantic Ocean meets fresh water from more than 150 major rivers and streams that drain into the Bay. This entire drainage area, often referred to as the Chesapeake Bay Watershed encompasses 64,000 square miles, and includes parts of six states –New York, Pennsylvania, West Virginia, Delaware, Maryland and Virginia—and the District of Columbia. More than 15 million people as well as 3,600 species of plants and animals make their home in this productive watershed! Shaping our history, economy, and culture, the Chesapeake Bay and its resources have long impacted how we live, work, and play. The Bay has been a source of food, commerce, and recreation for Native and Immigrant Americans. Shipbuilding, which began in Chesapeake Bay in colonial times, is still an important source of industrial, military, and related jobs. The Bay has been and continues to be crucial to world commerce. Roughly 90 million tons of imports and exports pass through the major ports of Baltimore and Hampton Roads each year. Nearly fifty military bases representing every branch of the armed forces currently are located in the Chesapeake Bay region. The Chesapeake Bay also is popular for recreation and tourism. Fishing, hunting, boating, sailing, beachcombing, and camping provide hours of fun for millions of people. Its recreation opportunities combined with many historical sites make this area a popular vacation destination, and tourism an important industry that provides many jobs. From a global perspective, however, the most notable residents of the Chesapeake Bay are not even human, but crustaceans and shellfish. More than one-third of blue crabs consumed in the United States come from the Bay’s waters. The Chesapeake also is historically known for its oyster harvest. Because of over harvesting and disease, however, the oyster population has declined to about one percent of historical levels. As a large, warm, shallow estuary, the Bay once provided extensive habitats for underwater grasses or SAV (submerged aquatic vegetation), which in turn provided ideal nurseries (food, shelter, and oxygen) for crabs, oysters, and many other species of fish and shellfish. The importance of the Chesapeake Bay to the well being of our region cannot be overstated; it is critical to the very existence and well being of many of our watershed residents—human and otherwise. Yet, as the 21st century dawns, it is clear that this invaluable and life-sustaining asset is vulnerable to our activities, and that we are vulnerable to the conditions one sometimes encounters on the Bay. To better manage this complex ocean and inland ecosystem, there is an immediate need in the Bay for a sustained and integrated coastal ocean observing system. Enable the sustained use of marine resources. High-quality and readily accessible data and information are critical to making wise decisions about the Bay, in relation to its condition and resources and our user needs to guarantee sustainable social, economic, and environmental benefits as well as our safe and secure passage in around and throughout its waters. The goal of CBOS is to develop a widespread network of observing and monitoring stations in open and deep water in the Bay tributaries and main stem. The purpose of these stations is to provide a steady stream of data and information that are currently lacking, according to decision makers, vessel operators, educators, and the public, would aid commercial, management, recreational, educational, scientific, regulatory, safety, hazard protection, and restoration activities on the Chesapeake Bay and Coastal Ocean Communities. Currently, the Chesapeake Bay Observing System (CBOS) is a nascent organization of data users and providers dedicated to the creation of integrated data observation, management, and distribution systems to provide products and information for commercial, management, recreational, educational, scientific, regulatory, safety, hazard protection, and restoration needs of the Chesapeake Bay and Coastal Ocean Communities. 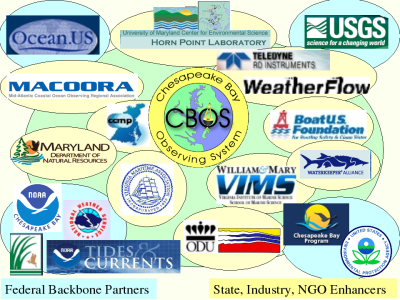 In the larger context, CBOS is an evolving sub-regional observing system embedded in the Mid-Atlantic Coastal Ocean Observing Regional Association (MACOORA) and the Congressionally-mandated Integrated Ocean Observing System (IOOS). Ultimately, CBOS is you, as a data user, to provide input and feedback about the kinds of observational data you need to do what you like (or need) to do on or near the Chesapeake Bay. CBOS is you, as a data provider, partnering with the IOOS Federal Backbone, State and District agencies, academic and research institutions, businesses, and non-profit organizations, to forge an “Observing System of Systems”! In some ways the National Weather Service (NWS), run by the National Oceanographic and Atmospheric Administration (NOAA), provides a model for the development of integrated coastal ocean observing systems. The NWS maintains a system of observations, data management, analysis and reporting all designed to provide weather forecasts and warnings for the public good. Virtually any time you check the weather on TV, the radio or from your favorite internet site, the information you obtain originated, most likely, from the NWS. NOAA’s NWS is a key CBOS partner and both a data user and data provider. The Chesapeake Bay Observing System (CBOS) was a subregional association and observing system being developed for: Serving the Ocean Observing Data and Information Needs of the Chesapeake Bay and Coastal Bay and Ocean Communities.